Given the popularity of crossovers and SUVs in India, compact crossovers are a very important genre for the luxury carmakers. These cars are often tasked with the responsibility of attracting first time customers to the brand. All the Europeans have strong contenders in place to do the job and Lexus doesn't want to lag behind. Their offering then, comes in the form of the NX crossover. 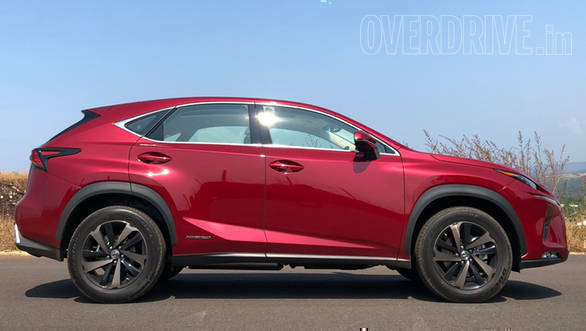 Interestingly, the 2018 Lexus NX unveiled to the Indian audience in November is the same refreshed model that broke cover at this year's Shanghai Motor Show. 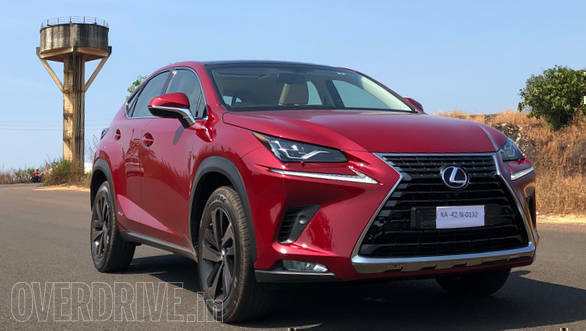 If you have been monitoring Lexus model lines for a while, then you might notice that compared to the original NX that debuted in 2014, the model you see here amps up the aggression and cleans up the facial details thanks to a new bumper design and revised air intakes. 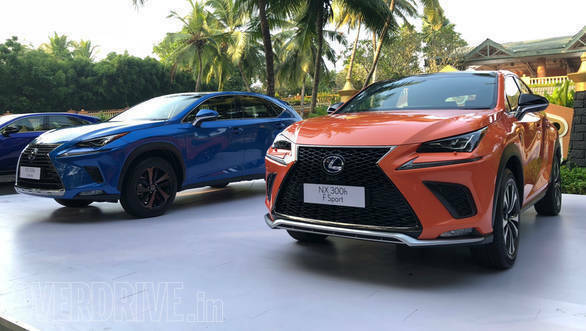 If you have taken interest in the Lexus line up only after their recent entry into India, then you will notice that the NX has a close familial resemblance to the RX. The squared wheel arches, the pinched window line, the swooping rear windshield and the sleek wraparound taillights highlight the connection. 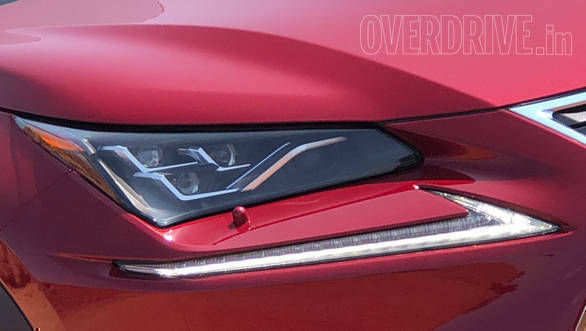 Look at it with a keen eye though and you will notice a more detailed three pot headlamp cluster and the harpoon shaped daytime running lights - both of which are quite similar to the lovely RC F that we drove earlier this year. In fact, the same shade of metallic orange that we loved on the sports coupé has also made it to the massive palette of 12 colour choices that NX is offered in, in the Indian market - and boy, does it look good! Lexus have also chosen two handsome designs for the machined-finish alloy wheels and their 18-inch diameter gives the NX a beefed up stance. The aggression is dialed up further with the optional F Sport trim that bears a more complex detailing on the polarising spindle grille and carves out larger intakes in the bumpers. Like most Lexus cars, the radical design of the NX may not be to everyone's taste, but compared to its Q, X and GL rivals, the NX enjoys more exclusivity. That is courtesy of a body that nicely merges compact crossover dimensions with sportscar inspired lines and details. While that design is one of its unique selling points, the other is a hybrid drivetrain - a greener and cleaner propulsion technology that none of its rivals offer in the Indian market. The hybrid powertrain gives this car its 300h moniker and the system consists of a 2.5l four-cylinder petrol engine that is mated to two electric motors for a total system output of about 197PS. There is a bit of a fairy tale welcome you get with the NX. The door handles light up when you walk up to the car and thumbing the starter wakes up the car silently in its pure electric mode, but with the displays and instruments lighting up with a soft glow. The only thing missing is flying fairies and sparkling sounds. The NX usually takes off with pure electric propulsion if the batteries have charge and soon after the petrol engine wakes up. 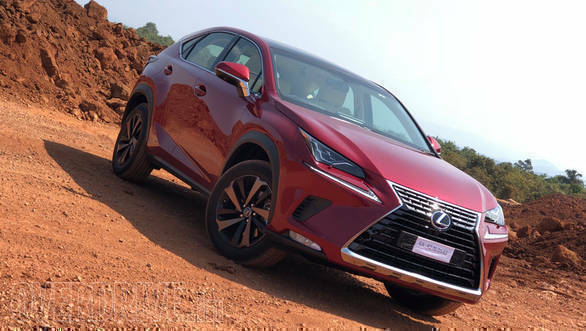 With both these power sources working in tandem, Lexus claims that the NX300h can do 18.32kmpl as per ARAI's Indian driving cycle, with a CO2 emissions value of 138g/km. The Lexus NX300h uses a 2.5l four-cylinder petrol engine that is mated to two electric motors. The petrol motor is good for an output of 155PS@5700rpm and 210Nm@4200-4400rpm. The total system output of the hybrid powertrain is 197PS. The power is routed to the road through an electronic continuously variable transmission and an electric all-wheel-drive system dubbed as the E Four. The hybrid powertrain predominantly drives the front wheels and the NX will resort to this configuration for majority of driving scenarios to maintain optimum fuel economy. But the E Four adds a third electric motor to the mix, whose sole responsibility is to propel the rear wheels on demand to aid grip. An intelligent torque vectoring system will summon the service of this motor in scenarios like spirited cornering, acceleration from standstill (because pushing is easier than pulling) and whenever it detects slip on the front wheels. 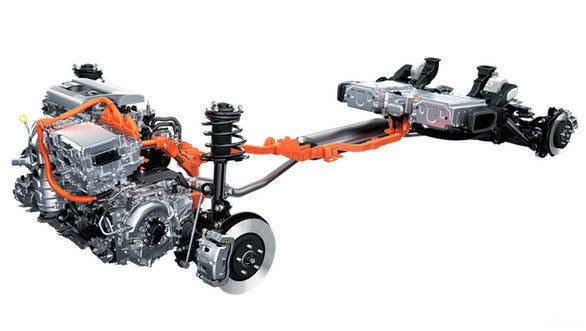 While the torque vectoring system is always alert, there is no way to manually activate the all wheel drive system. You can, however, choose between Eco, Normal and Sport modes to alter throttle and gearbox response using a rotary knob on the console. We have been spoiled by responsive and quick gearboxes in this price bracket and the e-CVT by nature feels laid back in comparison. The NX300h is, therefore, meant to be driven peacefully around town or to cruise effortlessly on the highway. It that sense, I believe it will appeal more to the sensible, economy and emission conscious buyer than the throttle mashing enthusiast. The aforementioned driving modes will also alter steering feel and suspension behaviour. The Lexus NX300h ships with adaptive dampers as a standard fit and these can alter damping forces as per the road or your driving intent. My initial impressions are positive on the ride comfort, at least on the roads of Goa, where we sampled the car. The overall noise insulation of the cabin seems quite good too. Speaking of the cabin, the NX offers plenty of upholstery options, depending on the trim you choose. Fit and finish is as premium as you would expect in a Lexus. The 10.3-inch infotainment system has an intuitive interface and finally chucks the annoying joystick controller for a friendly touchpad with haptic feedback. 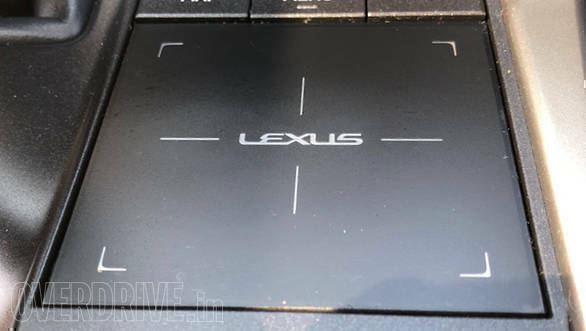 Lexus has also provided a Qi wireless charging pad in the tunnel console and I was happy to see the battery icon light up on my new iPhone without any cables attached to it (keep the sarcastic smiles to yourself, Android fanboys). Japanese women love checking up on their make up every now and then and that probably prompted Lexus to include a quirky feature - the wrist pad for the touchpad pops out to double up as a handheld vanity mirror! You also get a full colour head-up display for the tachometer, battery usage and satellite navigation. It's brightness, position and interface can be controlled using simple quick access switches on the dashboard, eliminating the need to navigate through layers of menus in the infotainment system. The cabin is secured with eight airbags, including a dual chamber airbag for the front passenger. Other safety systems include traction control, vehicle stability control and anti-lock brakes. Radar guided safety systems and assistance technologies have sadly been given the miss. Though our first drive lasted less than 70kms, I'm impressed with the space and comfort of the cabin. Some of the other luxury crossovers that sit on a similar wheelbase as the NX, don't seem as roomy in the back seat. That takes care of the most common complaint that buyers have with cars in the compact luxury segment. Speaking of space, let's put things into perspective. The NX has a wheelbase that's quite similar to that of the X1 or the Q3, but it's cabin space and kit is on par with the likes of the Q5 and the GLC. Its radical design and the hybrid powertrain set it apart from its rivals though. In theory then, all these attributes should work in its favour.